JCI Senate Foundation Each year $1000 will be awarded to graduating seniors who plan to continue their education at any accredited school. Click here for application. Grand Lodge of Iowa, AF & AM Grand Lodge of Iowa Masonic Scholarships will recognize students who have shown service to their school and community, emphasizing leadership roles in those areas. Grand Lodge of Iowa, AF & AM The "Mark Earl & Esther Ruth Spencer Technical Scholarship" is intended to help Iowa high school seniors who plan to enroll in a mechanical or trade course of study at an accredited Iowa Community College. America Farmers Grow Ag Leaders America’s Farmers Grow Ag Leaders is open and accepting applications for $1,500 scholarships from students continuing their education in an Ag-related field. Click here for application. Newspaper Scholarship Students preparing for a career in media are encouraged to apply for the Iowa Newspaper Foundation scholarship program. 2019 Conservation Scholarships Graduating seniors pursuing programs of study in any field of conservation or agriculture are qualified to apply for the Conservation Scholarship sponsored by Soil & Water Conservation Districts (SWCD). Click here for application! Aureon Scholarship Aureon is pleased to announce the launch of the 2019 Scholarship Program! Application & additional information are available here. Iowa Farm Bureau Federation Scholarship Iowa Farm Bureau awards $1,000 scholarships to students pursuing the completion of a two or four-year college degree pursuing a major in agriculture, nursing or education (please read over the detailed list of eligible majors under #7 of the Eligibility Guidelines, page 6 of the application). Click here for application site. Iowa Communications Alliance Scholarship The Iowa Communications Alliance Scholarship Committee awards scholarships to high school seniors who lives in a member service territory (traditional scholarship) or whose parent or guardian is currently employed by an Iowa Communications Alliance “Active Member” Company (member scholarship). The applications are available online here. SIEC Academic Scholarship SIEC Scholarship Program will award three $2,000 scholarships to high school seniors. There will also be one $2,000 scholarship available for Lineman School. Raymond G. Alvine Memorial Scholarship Fund. This scholarship seeks to assist deserving undergraduate architectural, mechanical, or electrical engineering students enrolled in the University of Nebraska system, Iowa State University, University of Iowa or Kansas State University. Click here for application. 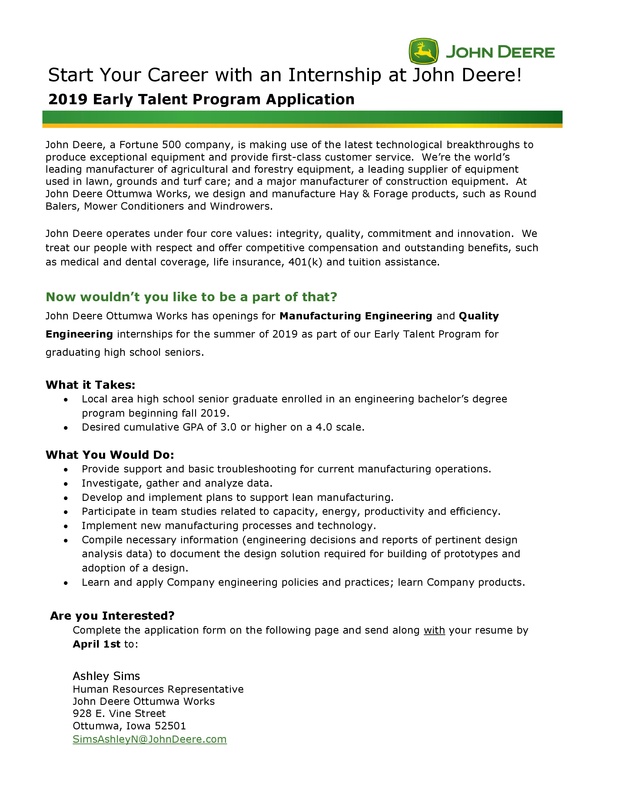 John Deere Summer Intern Program Local area high school senior graduate enrolled in an engineering bachelor’s degree program beginning fall 2019. Bloomfield Mother's Club Scholarship Any senior planning to study at any post-secondary school. Robert D. Blue Scholarship Any Iowa student who plans to attend an Iowa college or university is eligible for this award. Applicants are expected to demonstrate literary and scholastic ability; exhibit qualities of truth, courage, and fellowship; and display moral force of character. Iowa Financial Aid Know-How Challenge Scholarship The top 30 scorers on the challenge will receive a $2000 scholarship! Click here for more information! Iowa School of Beauty Scholarship Iowa School of Beauty offers scholarships to qualifying students interested in the beauty industry. Click here for more information. No deadline.